Craving some good Mexican food? Choose from our variety of traditional Mexican dishes that are made from the finest and freshest ingredients. Gluten-free options are available. 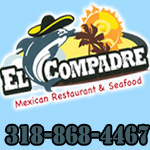 El Compadre Mexican Restaurant & Seafood is a local, family-owned and operated restaurant where you can enjoy delicious, authentic Mexican cuisine. We are open 7 days a week. Visit us today! restaurant is open daily from 11:00 AM to 10:00 PM.